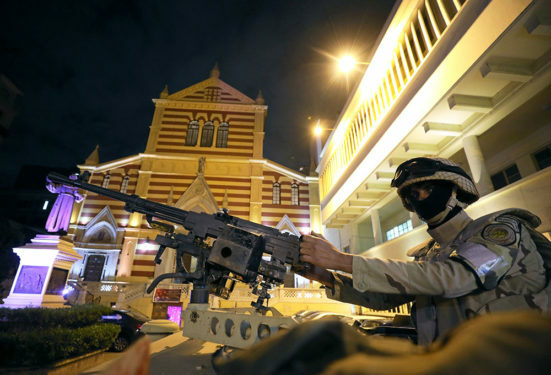 CAIRO – Egyptian authorities have arrested four men and two women suspected to be members of a terrorist cell behind a failed suicide attack on a church in Qalubiya governorate, the interior ministry said in a statement last Sunday. On Saturday afternoon, a suicide bomber targeted a historic church in Egypt, where hundreds of Coptic Christians were celebrating the Virgin Mary’s birthday (a religious celebration as Copts fast from Aug. 7-22). Two people were injured and the bomber was killed. The bomber, who was wearing a suicide vest, attempted to infiltrate the crowds of Copts outside Virgin Mary Church in Mostorod, Shubra Al-Khiema, north of Cairo, but he failed to reach the crowd because of the high security deployment so he blew himself up a distance from the target, officials said. Islamist militant groups, affiliates to the Islamic State, also known as ISIS, have claimed responsibility for several attacks on Coptic Christians in recent years. Although no group announced responsibility for Saturday’s attack, a lot of militants in Egypt are inspired by the Islamic State group. The interior ministry identified the bomber as Omar Mohamed Ahmed, 29 years old. After searching the bomber’s home, police found a Russian pistol, 27 machine-gun bullets, documents containing a detailed explanation of manufacture of explosive devices, around 71 thousand Egyptian pounds and two bottles of chloroform used in explosives devices. Also, the suspects of the terrorist cell had two automatic weapons, an Uzi pistol, 9-mm pistol, a large quantity of ammunition, half a kilo of gunpowder, nitrate, aluminum powder and acetone used in the manufacture of explosives, according to the interior ministry. Moreover, the suspects had a several electric circuits, remote control, a jar with an unknown liquid substance, a sack full of nails and a half a million Egyptian pounds, in addition to three cars, the statement added. Two of the suspects admitted that they added poisonous matter on the nails used to make the explosive devices to cause fatal injuries. After the Palm Sunday bombings in April 2017 that killed 45 people in two churches in Cairo and Tanta, Mokhtar Awad, a militancy expert at George Washington University, wrote that he had found evidence that Egyptian militants in the upper echelons of the central Islamic State leadership had established the network of cells in Egypt’s main cities. Christians make up more than 10 percent of Egypt’s population. In recent years, militants targeted them heavily. Groups affiliated to ISIS signaled their intent to wage a war by slaughtering Christians in their homes, businesses and places of worship. On Dec. 11, 2016, 29 worshippers were killed in a suicide attack on St. Peter and St. Paul’s Coptic Church, also known as El-Botroseya Church. Then on Dec. 29 of last year, gunmen opened fire on worshippers leaving St. Mina Church, a Coptic Orthodox church on the southern outskirts of Cairo, killing nine people. On May 26, 2017, gunmen attacked a Coptic Christian convoy on the way to the monastery of St. Samuel in Minya Governorate south of Cairo, killing 35 people. In Al Arish, northern Sinai governorate, which is northeast of Cairo, there are dozens of families who fled in droves after militants affiliated to the Islamic State, massacred seven Christian people, in series attacks in February 2016.